As Opportunity picked up the pace to Endeavour Crater this month and crossed the halfway point on the long journey from Victoria Crater and Spirit continued sleeping in hibernation mode, the Mars Exploration Rovers chalked up their 81st month of what was supposed to have been just a three-month tour of the Red Planet. Surviving its fourth harsh Martian winter has been, by all accounts, Spirit’s toughest challenge to date. The fact that the rover had been unable to extricate itself from a sandy pit and get to a favorable slope to tilt its solar arrays to the Sun before the winter cold took hold has made the challenge even more difficult. Once the low angle of the late Martian fall and early winter sunlight severely limited the solar-powered rover’s ability to generate power, to the point where Spirit didn’t even have enough energy to wake up and communicate, the rover shut everything down except the mission clock and emergency heaters for the main power batteries. Then, if she followed the program, went into a low-power or "hibernation" mode. But the last time MER mission controllers heard from Spirit was more than six months ago, on March 22. Not long after that, NASA and JPL engineers began -- and continue -- listening for Spirit to wake-up from its low-power fault and go into autonomous recovery, even though they really didn’t expect to hear from the rover for months. Then, a few months ago, after new models of Mars indicated that it was possible Spirit got so cold and lost so much power that its mission clock might have also faulted and shut down, the rover engineers initiated another strategy of pinging the robot field geologist instead of just waiting for it to phone home. If the rover’s clock stopped, Spirit has no idea what time it is -- and that would change the way in which the ground team would have to re-connect with the rover. 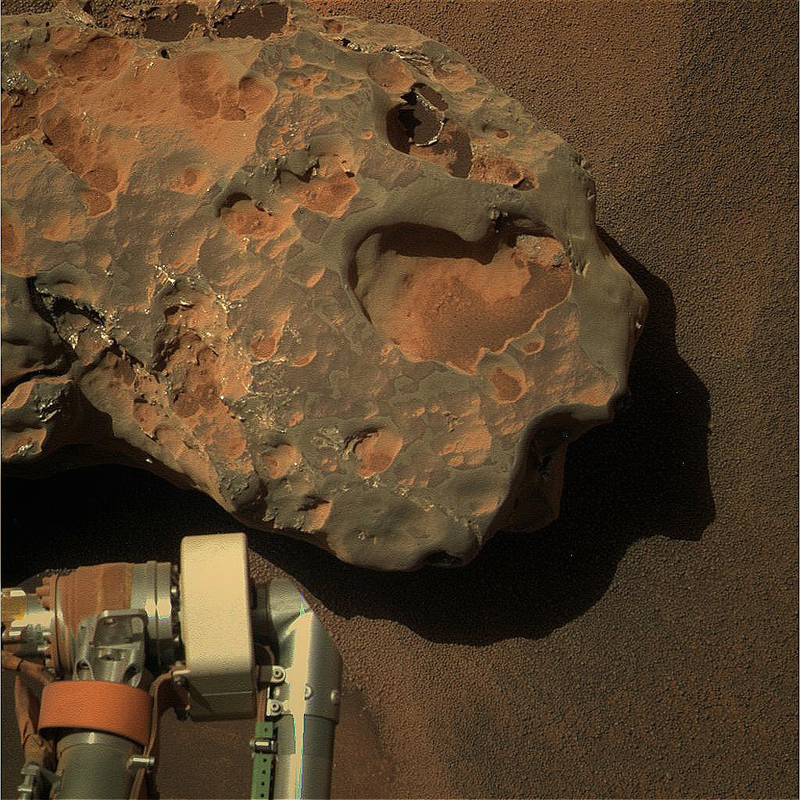 To cover that possibility, the team has been reaching out to the sleepy robot field geologist with a series of commands in a procedure they call sweep-and-beep since July. “Each command is designed “to nudge or prompt the rover to respond, if indeed Spirit has tripped the mission clock fault,” said Bill Nelson, MER rover engineering team chief at JPL. So far -- not a beep has been heard from Spirit in more than six months. "Oileán Ruaidh & Her Sisters"
To slam into Old Meridiani like Kal El’s capsule into The Kents’ cornfield . 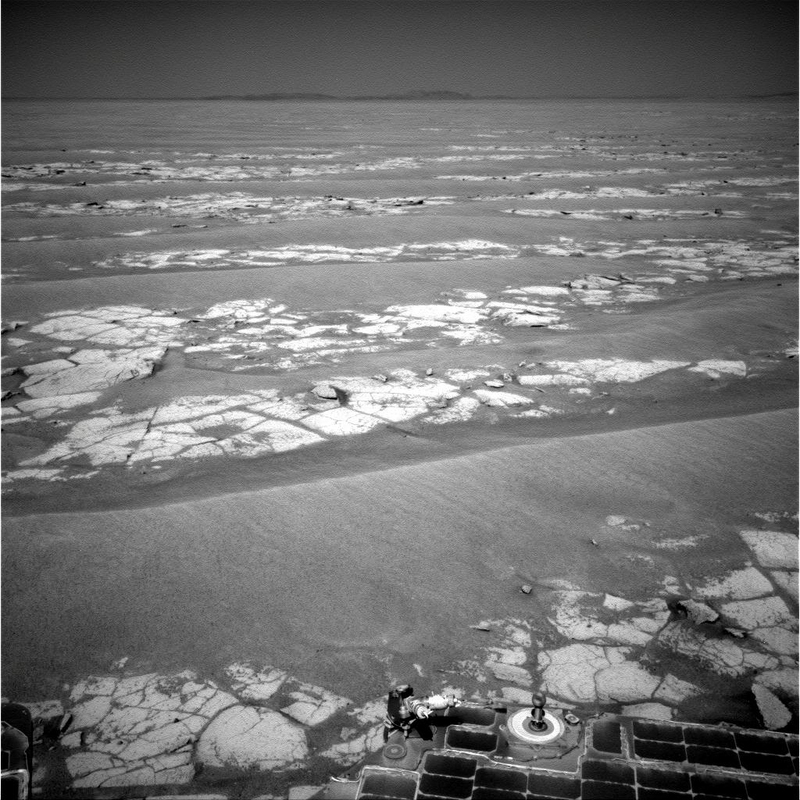 . .
For the MER team, it hasn’t been much of a surprise that September proved to be another quiet month for this rover. While the advancing springtime in the southern hemisphere of Mars is beaming stronger rays of photon “fuel” down on Spirit’s solar panels and power levels are believed to be improving, atmospheric conditions historically deteriorate during the Martian spring. It’s the season when the planet’s notorious winds can whip up, sometimes intensely, stirring up the powdery rusty-red dust and causing the skies to get hazy enough to cancel out any boost in energy from the increasing amount of sunlight. Based on models of Mars' weather and its effect on available power, a response from Spirit might have arrived this month, but most engineers have been consistently predicting the rover would wake up in October or November. Team members continue waiting patiently and nothing seems to have dampened the collective belief that they will hear from Spirit soon. “Our early projections were that maybe the rover would beep in mid-September, with the more likely time mid-October or later,” reminded Nelson. For now, “everybody’s focusing on Opportunity,” said Arvidson. On the other side of Mars, Opportunity really picked up the pace at Meridian Planum, literally zipping over patches of bedrock and past the halfway point to Endeavour Crater this month. 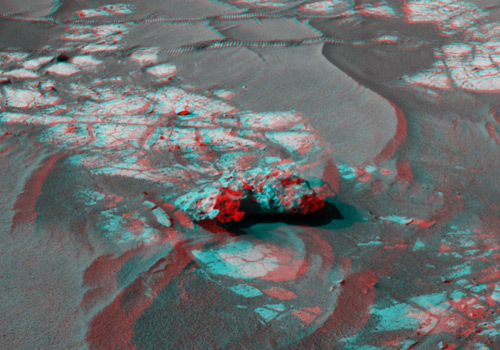 “Outcrop is just generally better for driving, because there’s less soil -- the wheels like it better Opportunity’s visual system likes it better,” noted Maxwell. 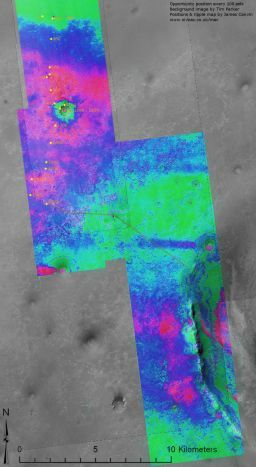 Back in September 2008, when Opportunity pulled away from Victoria Crater and headed out on the 19+-kilometer journey across the Meridiani plains to Endeavour, the assignment seemed more than a little ambitious. Now -- with the hills of Endeavour looming ever larger on the horizon, miles of seemingly friendly terrain ahead, and Opportunity burning up the plains sol-after-sol with one extended sprint after another this month -- the destination suddenly seems realistically in reach. The drive limits imposed last year on Opportunity because of its chronic, ‘hot’ right front wheel were eased this month, ‘unleashing’ the rover to drive as much as 140 meters in one sol if it can, thus doubling the 70 meters to which it had been restricted. “We haven’t been doing any drives that are getting us that far yet, but 140 meters is a number we can probably hit and it’s going to be a nice comfortable distance for us,” said Maxwell. That’s not all. The rover drivers are talking about some other “tricks” that would enable Opportunity to drive even farther and “faster,” Maxwell added, saying there are a couple of ideas being worked in the pipeline. 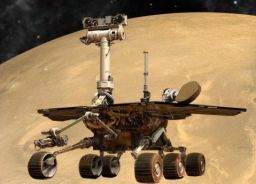 It will take tens more meters, however, for this rover to beat its own record of 220 meters, made back in 2005, “before the Purgatory embedding,” recalled Nelson. 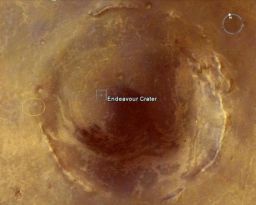 At about 22 kilometers (13.67 miles) in diameter, Endeavour is about 28 times wider than Victoria Crater at 800 meters (a half-mile) in diameter, and on this crater-hopping part of the MER mission, size does matter. 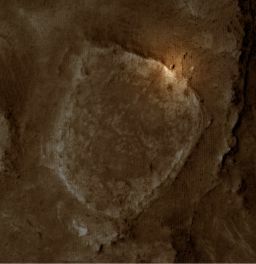 More than an impressive landmark to behold in orbital images, Endeavour’s humongous size indicates that this big hole in the ground holds secrets of a more ancient Mars, a time long, long ago when the planet just may have been habitable by life. As the MER luck would have it, the story in recent months got better and the next big attraction became even more compelling when scientists working with the Compact Reconnaissance Imaging Spectrometer (CRISM) instrument onboard the Mars Reconnaissance Orbiter found hydrated sedimentary rocks near Endeavour and clay minerals on its rim. Both these rocks and clay minerals are evidence of past water and by extrapolation past habitable environments. Moreover, no mission has ever studied this evidence up-close, on the ground -- although the next rover, the Mars Science Laboratory (MSL), aka Curiosity, is being sent to do just that. In fact, the race between MER and MSL was declared “on” in last month’s MER Update, so Opportunity is looking to make history once again. 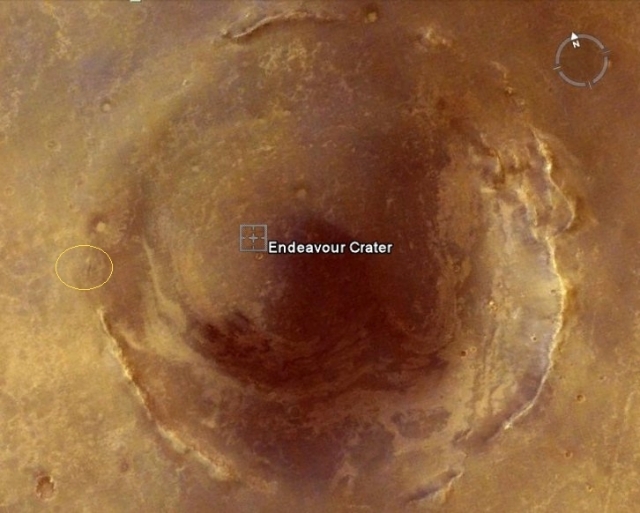 Despite being a robot, the rover still has to stop now and again to rest for a while, and there are a few chosen targets and planned studies on Opportunity’s science agenda between its present location and Endeavour, including a “fresh crater” called Santa Maria, Arvidson said. The rover will also make a couple of stops to sample bedrock and a couple of stops to sample soil for the ongoing study of the surface, and it will also check out another few meteorites, if not close-up then with drive-by “shootings” to image the alien stones. 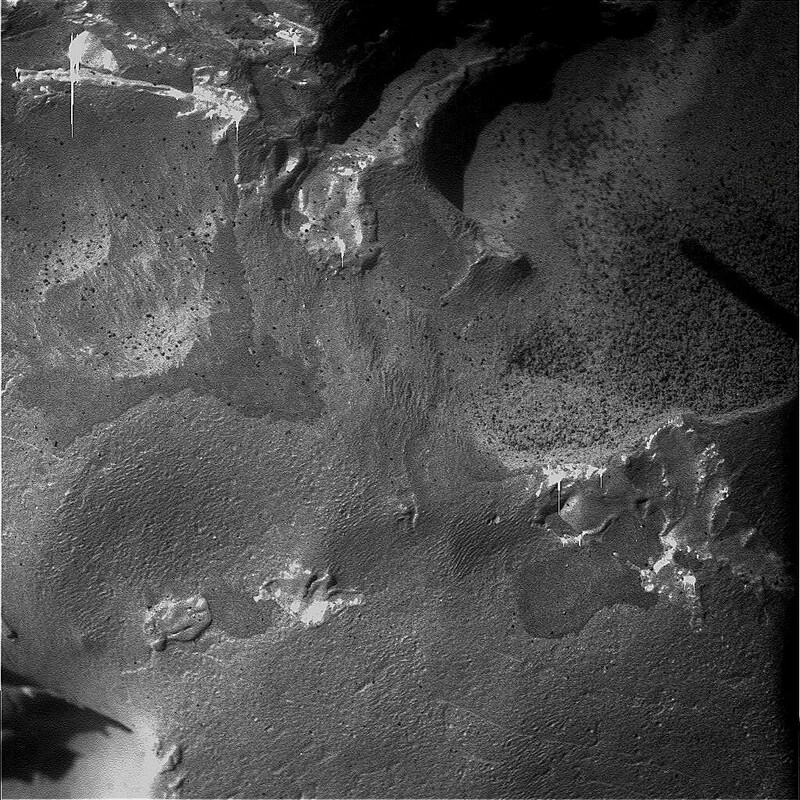 Meanwhile, Opportunity’s iron-detecting Mössbauer spectrometer began exhibiting some “anomalous behavior” this month. It seems to have garnered an extreme sensitivity to cold and is not working during the Martian evenings and late nights. The good news is that it still seems to work just fine during normal business hours, one might say, or the warmth of the Martian sol. The science team definitely wants to be able to use this instrument as it comes upon hydrated rocks outside Endeavour and once the rover gets to the clay minerals on the rim, so understanding this newfound sensitivity is important. 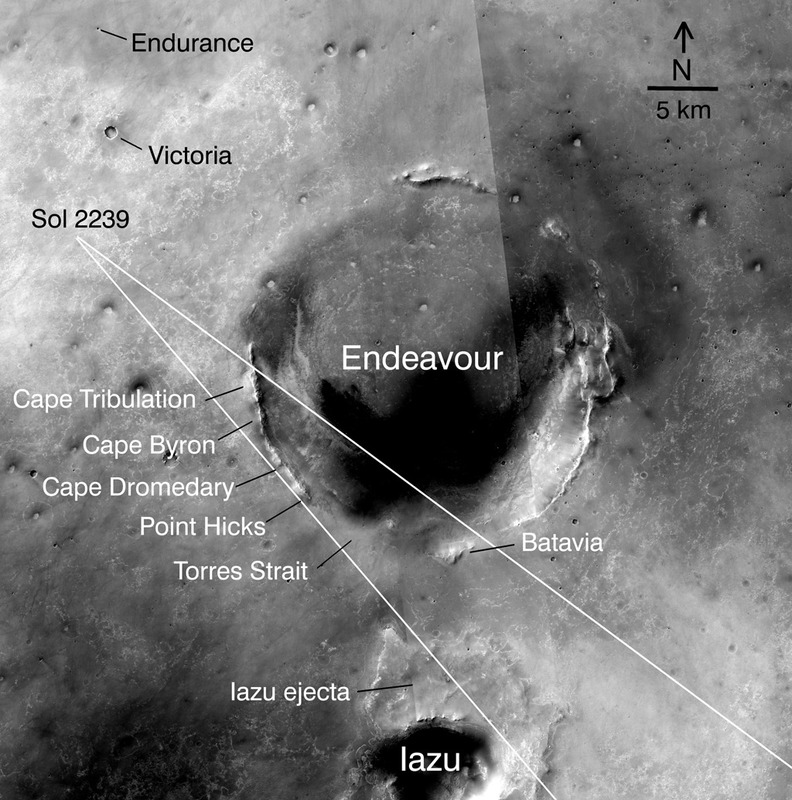 On Monday September 27, 2010, its Sol 2374, Opportunity hit the road. After putting 99.83 meters behind it, the rover revved up and drove again the following sol for 62.47 meters. A 120-meter drive was planned for yestersol, “the first 80 meters of which blind and the 40-meter balance done with autonav,” informed Nelson. “Given the available time, we expect to only complete about 95 meters,” he added. That kind of optimism, combined with something that could only be described as a special brand of mutual engineer-scientist respect and camaraderie, has served the team well, even turned the MER mission into a legend in its own time. On a practical level, it has enabled the team to demonstrate again and again during the last seven years, what honest commitment, extreme dedication, hard work, long hours, and integrity can create. 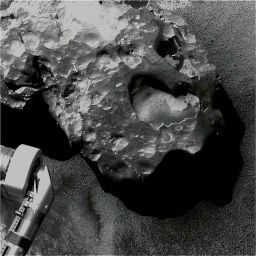 Although for the last six months only sounds of staticky silence have been flooding out from Spirit’s location on the west side of Home Plate in Gusev Crater, when the rover does wake, assuming she does, the first robot to hibernate on the Red Planet will no doubt have many new riches to offer in lessons learned about robot survival on Mars. Until then, picturing Spirit silently parked along the edge of a shallow, long-hidden crater as the Martian spring winds kick up dust devils and swirls them across the landscape evokes, for MER followers and crewmembers alike, emotions that have pervaded this mission, not the least of which is a deep love (or, okay, like for those team members opposed to anthropomorphizing) for two golf-cart-size robot field geologists. This Martian winter, the rovers’ fourth, proved however to be the coldest. Spirit’s internal electronics clearly experienced much lower temperatures than pervious winters because its heaters could not always be powered when needed. That, along with recent models of Mars’ climate, have indicated that it’s possible the rover may have also tripped a mission clock fault. The problem is, there is no way of knowing since the team has had no ‘read’ on the rover since late March, and that complicates recovering Spirit. Suffice to say, recovering Spirit is not just as simple as -- the Sun shines down on the solar arrays and she wakes up, stretches and moves on. If only it were that simple. 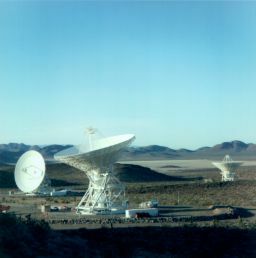 In this recovery from the low-power fault, “Spirit will attempt to phone home, waking up every sol at a set time, nominally 12:15 pm, but probably a little earlier from clock drift,” informed Nelson. The team has been listening for Spirit with the Deep Space Network (DSN) and the Mars Odyssey orbiter for the rover’s autonomous recovery communication from the low-power fault since April, almost immediately -- even though they did not expect to hear from the rover for months. But as the weeks passed, the reality of recovering Spirit got more complicated with the potential of a mission clock fault. If it turns out that Spirit has gone into mission clock fault, the recovery scenario changes fairly dramatically. “In this case, the rover goes into a mode where it wakes up every 27 hours, and if there isn’t enough power, then it goes back to sleep and waits another 27 hours,” said Nelson. “When there is enough power to wake-up, the rover will get up for between five and 10 minutes, just long enough to power things up and check for a signal called solar groovy.” That signal essentially means the rover has 1.1 amps of power coming off its solar array. “If it’s not solar groovy, then it shuts down again,” said Nelson. If it is solar groovy, the rover in this state would not beep its team on Earth. Rather, it would listen for a message coming from Earth. Whatever the case, whichever the scenario, the team is prepared and responding pro-actively, both listening and reaching out to Spirit with a series of pings in a procedure called sweep-and-beep, as reported in previous MER Updates. In this complete wake-up, Spirit will signal its central processing unit (CPU) or brain to come back online in autonomous mode. 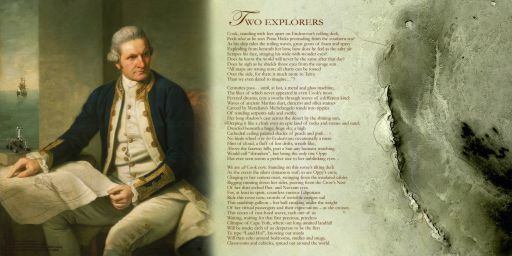 “That means the rover won’t do much but keep itself safe,” Nelson reminded. Spirit won’t actually be able to check tau or conduct other basic tasks because those are commanded sequences, which, with the low-power fault, will have been lost. When the rover’s computer is ‘sleeping,’ it is using considerably less energy than when it is up and on, just like your laptop or desktop computer -- or your brain, ostensibly. “So the delta in energy between awake and asleep allows the rover to put that energy into the battery and charge it up some more,” Nelson added. So, if Spirit wakes up and is solar groovy and producing 1.1 amps of power, she will stay up for 20 minutes, then shut down and continue this routine until she hears from the team. 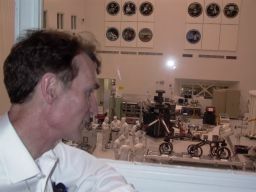 “If it’s not solar groovy, the rover goes back to this waiting every four hours,” said Nelson “The effect of this is intended to wake-up Spirit later and later on successive sols, so eventually it will be waking up in the time period when its gets a solar array wake-up, another signal from the solar array indicating that the rover has 2 amps of power coming off it. “That, in turn, signals an autonomous wake-up to the CPU,” Nelson pointed out. That is the little dilemma that initiated the sweep-and-beep procedure last July, when the team decided to call the rover just in case it did trip the mission clock fault. “We’re now sending sets of commands, each one of which should provoke a beep,” said Nelson. “And we know a beep is five minutes of carrier-only signal, about the minimum that we can transmit, minimum energy usage, and yet still be able to detect it on the ground reliably. The sweep-and-beep is our attempt to get the rover to talk to us and of course it won’t do that until it is ready to start recovery,” Nelson summed up. Yes, the sweep-and-beep will override any low-power comm session. “But we can, using the timing of the downlinks and by not sweeping and beeping for a few days, determine which fault mode Spirit is in,” Nelson clarified. 2) The rover attempts a wake-up and now finds sufficient power. It checks for solar groovy. If it doesn’t have the 1.1 amps of power that is solar groovy, it shuts down for four hours and tries again. The rover now wakes up every four hours instead of every 27 hours. 3) The rover attempts a wake-up and now finds solar groovy. It completes the wake-up, set comm window for an hour in the future then will "hang out and catch some rays." Now several things could happen following this stage: Either solar groovy ends or the up-too-long duration of 20 minutes expires, said Nelson. The rover shuts down with wake-up in 21 hours. Or, in 21 hours, it wakes up, probably does not find solar groovy, so shuts down to try again in four hours. (It’s now 25 hours since the rover’s last wake-up with solar groovy.) Likely, the rover will continue with wakeups every four hours until energy improves. Got it? Clearly, waking Spirit up is a far cry from nudging your loved one, or setting a screaming-loud alarm clock knowing it’ll do the trick. But the MER team has its playbook, and no matter how Spirit emerges from hibernation, the engineers will find the way to recover their charge. So far, Spirit’s sounds of silence are of no increasing concern to the MER team. Although power levels are expected to be improving with the advancing springtime in the southern hemisphere of Mars, atmospheric conditions historically deteriorate and the skies overhead get dustier because it’s the season when the infamous winds kick up. Thus, a response from Spirit has not really been expected until October or November. Backstage at JPL and other places of MER gatherings, hope still floats and buoys the optimism that is a hallmark of this team. After finishing its study of Cambridge Bay, Opportunity roved out of August and into September, really picking up the pace this month on its 19-kilometer (11.8 mile) journey from Victoria Crater to Endeavour Crater. With the rover’s chronically ‘hot’ right front wheel looking good, the team decided in late August to kick it up a notch. “We had limited drives to no more than 70 meters to keep the right front wheel current in check,” said Nelson. That limit was instituted last year after the rover’s right front wheel actuator or motor continued to draw more than its fair share of current. Late in August however the team “temporarily” raised that to 90 meters, enabling the rover to drive for some 70 meters in a sequenced run and following that with about 20 meters worth of backward autonav. Using that combination of sequenced or blind backwards drives -- where rover planners chart a path based on visual imagery taken by the rover then command the rover to execute it -- and backwards autonomous or autonav drives, where the rover drives itself, using its own ‘smarts’ in hazard avoidance -- Opportunity put 89 meters (292 feet) behind her on Sol 2347 (August 31, 2010). 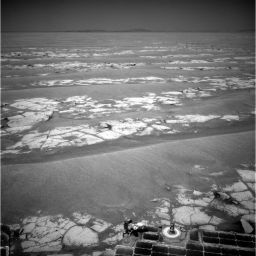 And on the first day of September, Sol 2348, she added another 40 meters (131 feet) to her odometer. Overall, September was a month of newfound freedom for Opportunity. Through a combination of factors -- including the bedrock rich terrain, the fact that the terrain conforms better with the rover’s visual system, and ever-increasing sunlight -- this rover and her team have been really extending the drives. Now, with outcrop cropping up everywhere, there is much more variation in the terrain visuals. “In the 3-D correlater system that we work with, we can actually now get good range data out 150 to 160 meters -- and that really extends the amount we can drive each sol,” said Maxwell. Concerned about the problematic right front wheel, the roever engineers have been “gradually extending the drives from 70 meters per sol to about 90 meters, and then from 90 meters to 110 meters,” Maxwell offered. On Sol 2349 (September 2, 2010), Opportunity roved again making tracks for 80 meters (262 feet) to the east. And after a Labor Day weekend holiday pause, the rover resumed driving again on Sol 2353 (September 6, 2010), heading east by south on that drive, for an impressive 111 meters (364 feet). The post-Labor Day drive pushed her odometer to 23 kilometers (about 14 miles) and took the rover past the halfway point of the approximately 19-kilometer (11.8-mile) journey from Victoria to the western rim of Endeavour. The ‘road’ ahead looks as inviting as it does rover friendly. Crazy as it sounds Opportunity seems to be driving as well as she ever driven -- despite going it backwards, having her right front wheel toed in a tad, and having to hold her arm or instrument deployment device (IDD) out in the fisherman position. 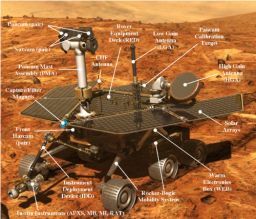 The rover ripped into the second week of September on Sol 2355 (September 8, 2010), pushing the pedal to the metal and driving approximately 105 meters (344 feet). That same sol, the rover ran some diagnostics on its Mössbauer spectrometer, which suddenly appears to have become ultra-sensitive to the cold of Martian nights. The test on this sol was conducted at warmer temperatures and the instrument functioned normally. The engineers and Mössbauer team went back to the diagnostic drawing board. As the second week of September progressed, Opportunity continued making progress on the trek to Endeavour, testing new driving techniques along the way. On Sol 2358 (September 11, 2010), the rover added another 106 meters (348 feet) in a series of steps. The last segment of the long drive was a simulated test of autonomous navigation using rear hazard avoidance camera (Hazcam) imagery, while driving backwards. Autonomous navigation is limited for backwards driving because the rover's low-gain antenna (LGA) is in the field of view for the Pancam mast assembly mounted cameras and so the team a couple of months ago instituted a workaround that basically involved the rover turning a little each way and snapping additional images to be ‘stitched’ together by team members and enthusiasts alike down on Earth, thus ‘erasing’ the LGA from the final view. The rear hazard avoidance cameras, however, are not obstructed by the LGA and further tests of the backward-autonav-Hazcam technique were planned. 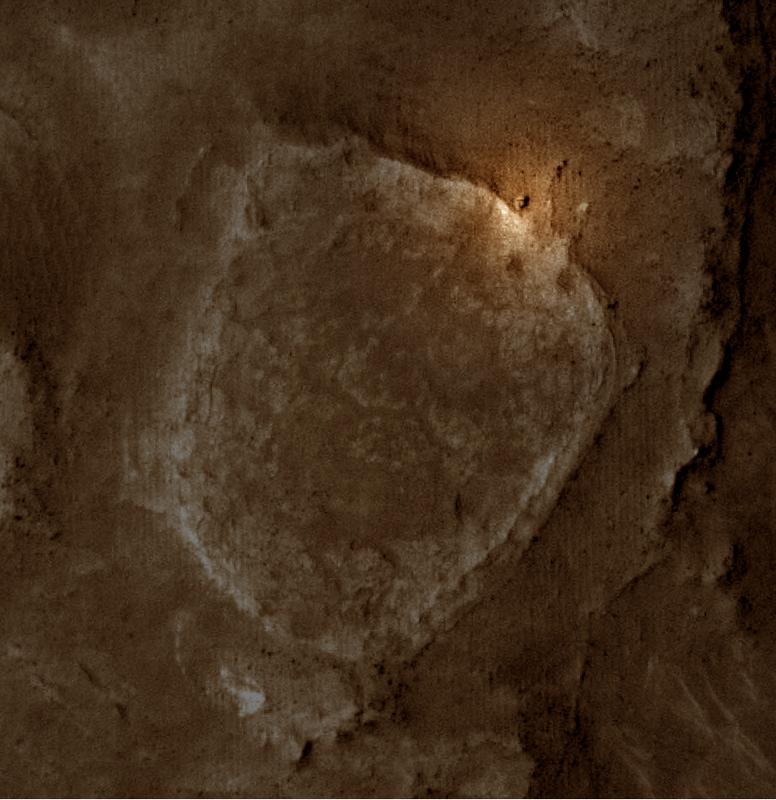 This image, created with orbital images taken by the HiRISE camera, and Context camera onboard the Mars Reconnaissance Orbiter, has been annotated by Eduardo Tesheiner, a senior member of UnmannedSpaceflight.com. 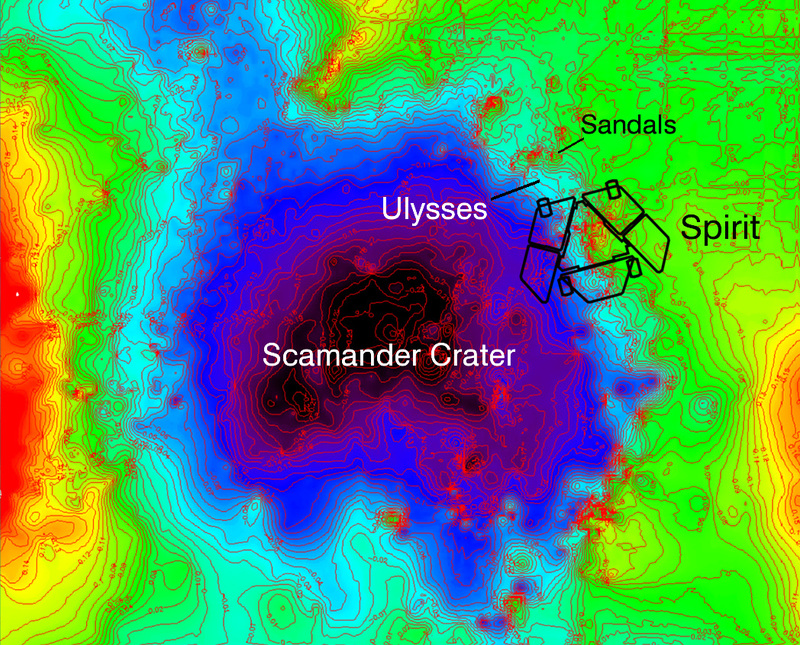 It shows the rover's charted route from the San Antonio twin craters to its location at the end of this month. Opportunity also continued the investigation of the Mössbauer spectrometer on Sol 2358 (September 11, 2010) with a test at cold temperatures. In that test, the instrument exhibited the anomalous instrument behavior at both the start and the end of the 30-minute integration. Tests at other temperatures are planned to map what now appeared to be temperature-dependent behavior. 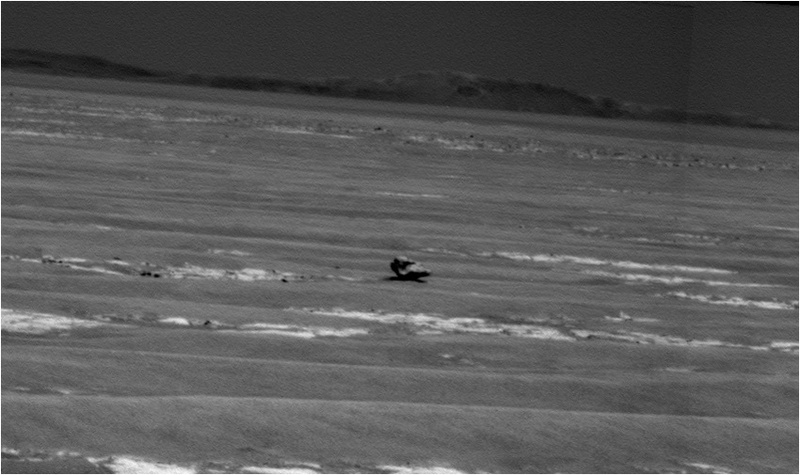 The roverfinished out the second week of the month with another drive on Sol 2361 (September 14, 2010), making tracks over 54 meters (177 feet) to the southeast. Cruising onward into the third week of September, Opportunity locked on another large meteorite, positioned just off the charted route to Endeavour. “We were kind of bombing along the plains and the scientists suddenly went -- ‘Ohhh, shiny’ -- and there was a meteorite,” recalled Maxwell. On Sol 2363 (September 16, 2010), Opportunity drove more than 80 meters (262 feet) toward the meteorite that was quickly named Oileán Ruaidh (pronounced ay-lan ruah), the Gaelic name for an island off the coast of northwestern Ireland. The rover also conducted yet another diagnostic test on the Mössbauer spectrometer, this time at an intermediate temperature. The instrument worked normally throughout the diagnostic test. 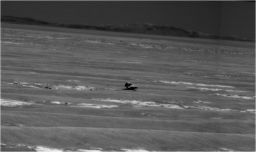 On Sol 2367 (September 20, 2010), Opportunity took a a 36-meter (118-foot) drive to approach Oileán Ruaidh, snapping pictures as she went, driving backwards with a deliberate drive-by in order to position the rover for a forward approach. The following sol, the rover capped the third week of the month with a 9-meter (30-foot) semi-circumnavigation of the meteorite as her team planned for the rover to drive in close for an in-situ investigation with her IDD instruments. Opportunity spent most of last weekend, September 25-26, 2010, checking out the composition of Oileán Ruaidh with her alpha particle x-ray spectrometer (APXS). The half-life of the APXS is 18.9 years so “it’s still going pretty strong,” said Nelson. With this investigation of Oileán Ruadh, and another tempting target and probable meteorite called Ireland just 30-some meters away, the science team huddled. They decided that in the immediate future Opportunity would conduct a drive-by shooting of Ireland before it taking off on more long sprints to Endeavour, snapping pictures on approach to Ireland, again as it passes the shiny rock, and again as it gets 5 meters beyond it. The decision was, like the team, logical and judicious. The plan stays the course. Opportunity will “make a beeline” toward Endeavour. “We’re not going to stop and take any other meteorite measurements for another 3000 meters,” said Arvidson. 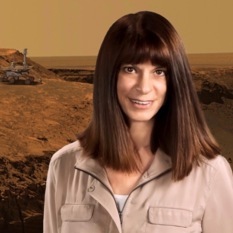 Furthermore, the plan calls for the rover to stop only two or three more times to sample bedrock and once or twice for soil samples for the ongoing Victoria-to-Endeavour surface study. And, yes, they are planning for the rover to stop at Santa Maria, just a short jag off the route. On this fairly “fresh” crater, it appears that the impact has “punctured through the bedrock,” as Arvidson put it. Now about 2.7 kilometers away, Santa Maria is luring the team for another reason. It could be that the race to find phyllosilicates will be over before Curiosity even launches next year. That of course remains to be seen, but the road ahead looks marvelous for Opportunity and the outlook is as bright as one could possibly dream it could be at this point in the mission, more than six and a half years after landing. “There’s a good few kilometers where we’re on outcrop and then a few kilometers where it’s just flat -- as flat as a tabletop. So it might just as well be the case that we’ve been through the hard part and from here on, metaphorically speaking, it’s all down hill,” said Maxwell, echoing the expectations of others. Given that these rovers have been roving around for nearly seven Earth years old, most of which has been past their “warranties,” such hard-driving almost seems like an awful lot to demand. The MER engineers are ever cautious though and pretty darn skilled at the balancing act after all these years of exploration. From her parked position at the meteorite Oilean Ruaidh, Opportunity took this drive direction mosiacked image of the 'road' ahead. Check out the tracks, ripples, bedrock, the meteorite named Ireland in the distance, and and the 'twin peaks' on the north rim of Endeavour. 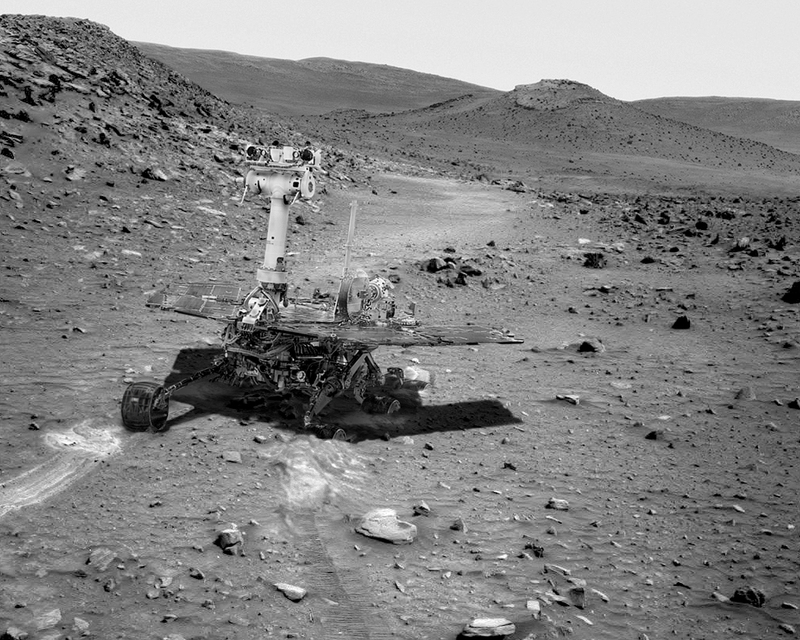 Opportunity put another half-mile on her odometer in September, and in coming sols the rover will continue to focus on her prime directive of “drive, drive, drive,” as Squyres has so often put it. But tomorrow, the rover will take a little time to help her less fortunate twin. 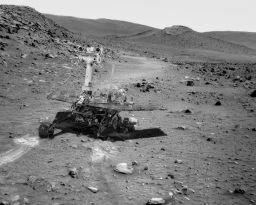 The rover engineers plan anyway to conduct a sweep-and-beep test with Opportnity tomorrow, rescheduled from yestersol, to ensure the strategy the team is currently employing to reach out to Spirit works as designed. “One should do one’s due diligence every chance one gets,” offered Nelson, “and so we’re just double-checking that our thinking is correct."